More in Heaven and Earth: I don't care whether you're for YES or NO. For God's sake please actually go out and vote in the AV referendum on May 5th! I don't care whether you're for YES or NO. For God's sake please actually go out and vote in the AV referendum on May 5th! We are now rapidly approaching the 5th May and the long awaited referendum on whether for elections to parliament we should switch from First-past-the-post (FPTP) to the Alternative Vote (AV). I would like to say that national conversation has been buzzing with the excitement of quite possibly our biggest constitutional change for a century. I would like to say that campaign has been dominated by thoughtful and accurate but accessible explanations of the different mechanics and likely effects of switching to AV or not. But, that would be an utter lie! 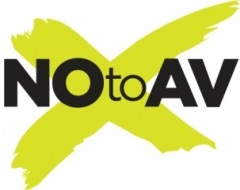 Sadly, the truth is that the AV campaign has so far almost entirely passed the public by. Without the scale and widespread organisation of the main political parties the campaign has just not had the bulk necessary to seriously enter the national consciousness or disturb the thoughts of most of the population. The Yes2AV and No2AV campaigns have been chipper and enthusiastic but thus far largely ineffective. With disaster in Japan, War in Libya, Politics at Home, Local and sub-national elections their message has been largely crowded out. On the other hand this is quite possibly a good thing as the AV campaign has been almost certainly the worst political campaign I have ever seen. Both sides have barely even tried to wade into the complexity of explaining the somewhat technical differences between FPTP and the proposed AV system. Instead preferring to throw a vast wave of heavily emotive sheer rubbish at the electorate in the hope some of its sticks. It has been truly awful, with a particular low point from the No side with their Vote No or the Baby gets it line of argument only just beating the Yes campaign's repeated massive non-sequiturs that AV will make politics fairer, MP's work harder, expenses lower and is apparently a more 'modern' system, all without explaining precisely how or why these miracles will occur; not to mention end safe seats (no it won't), make every MP have the support of 50% of his constituents (no it won't), end tactical voting (no it won't) and make election results more proportional (actually in direct contradiction to ending safe seats). Not to mention simultaneously claiming that it will harm the BNP and also help smaller parties (connect the dots between those two if you can). Both sides have also managed to scrape the barrel when it comes to chasing celebrity endorsement rather than discussing to issues and more widely planning the man rather than the ball. The campaign over AV has been even worse in quality than our last general election, which was itself a new low. In case you have forgotten that campaign was largely occupied by an argument over making £6 billion of cuts between two parties who were planning to cut £80 billion and £50 billion respectively, shortly followed by an unbelievably silly and impressively short lived personality cult based on one semi-decent TV performance that then fizzled out even before election day two weeks later. It was pretty grim, but it has been surpassed in sheer balloon-faced stupidity by this AV campaign (from both sides). It gets worse though. Largely due to the bizarrely low profile of the AV campaign itself, and also, I think, due to the crass, irrelevant negativity of the two campaigns, there is a record low engagement with this important constitutional change. At this stage in the campaign Yes and No are roughly equal in the polls, leading to the possibility we could see major constitutional change with the support of perhaps 12% of the electorate. I call that pretty grim. Lest you think I am exaggerating let me explain myself. Turnout in general elections is about 2/3. Turn-out in devolved, local and European elections is commonly about 35%. I have seen nothing to convince me this referendum has a higher profile than the concurrent local and devolved elections. And see every reason to believe it will be lower. People are used to local elections, they are somewhat aware of them as they come along with reasonable regularity. They are also spurred by the high-profile of party politics. The AV, as a non-party political one-off, has none of these benefits. I was recently shocked to discover the people in my office between them knew almost nothing about AV and cared almost less. These are highly educated people working in one of the UK's top universities. I would put them in easily the top 20% of the country for expected general political awareness and engagement, and they were barely aware a referendum was even happening. In places where there are local/devolved elections I expect turnout to be slightly lower than for those, where there are no local elections I expect turnout to be even worse. All in all this means we can expect a turnout somewhere between 20-30%. On the higher end of that if we're lucky, the lower if we're not. Combine that with an expectation that the result will be close, and we have AV defeated or accepted with roughly 11-16% of the electorate. This is dire, you have to go back to the mid-19th Century to find a time when such a small percent of the population got to decide the direction of our constitution. Though, embarrassingly, this time the problem is due to apathy rather than legal restriction. It will be a terrible shame if such serious an issue that so affects us all were decided by a thin majority on a tiny turnout. Something that would quite possibly lead to a crisis of legitimacy for the new or retained system, stuck without any real democratic mandate. It will certainly leave a legacy of bad feeling and mistrust about such change. It is in all our best interest, whether win or lose, for as many people to be involved in this crucial democratic decision as possible. This is the reason for the headline of this article. It doesn't matter whether you are for AV or against it. Please, please go out and vote on May 5th! If you don't have an opinion then get one. If you know nothing about the issue then please take a small amount of time to get yourself at least reasonably informed. Whatever the case MAKE SURE YOU GET OUT AND VOTE!!! My name is Stephen Wigmore, I'm a recent Philosophy PhD graduate, and this is my personal Web Log on Tolkien's Middle Earth, Great Poetry, Philosophy, History, Christian faith, etc. I hope there's something you'll find interesting. "There are More things in Heaven and Earth, Horatio, Than are Dreamt of in your Philosophy"
This quote from Shakespeare's Hamlet is the inspiration for this Blog, and its title. It is something that my mind has gone back to it again and again. Our lives and world are, and can be, richer and better than we imagine. There is more wonder around us than we can dream of, and we can always understand more fully, consider more widely.